To celebrate the World Water Day and the International Year of Water Cooperation, in 2013 the Ministry of Environment and the National Water Agency have launched the Consolidation Program of the National Pact for Water Management (PROGESTÃO). The action will make R$ 100 million available, in next the five years, for the states that reached the goals agreed between the Federal Government and such states. So that the states may receive the resources from the PROGESTÃO, the Governors must first sign a decree of enrollment to the Water Pact, which is a strategy of federative cooperation aimed at strengthening the water resources management systems and state agencies, and for their better integration in the scope of the National Water Resources Management System (SINGREH). However, the Water Pact should not be confused with any other current planning or normative tool. In fact, it is a joint effort for administrative and political coordination aimed at supporting the implementation of the Brazilian model of water management; a model that must be integrated, decentralized and participative, as provided by the National Water Policy. The financial resources of the PROGESTÃO – the backbone of the Pact – are only released after the goals established by the states, and approved by their respective State councils – which rely on the participation of representatives from the civil society and user industries – for water resources have been complied with. At first, up to five installments of R$ 750 thousand each will be released per state. ANA’s aim is to foster the strengthening of the state systems of water resources management through actions aimed at improving the implantation of the management tools foreseen by the National Water Policy and by state policies. The PROGESTÃO stimulates states to adopt some actions, such as: the improvement of the monitoring network of rivers, database formation concerning water availability or issuance of grants (authorization) for use of water resources, drafting of basin studies and plans, training or deployment of charging for the use of water resources. In addition to seeking to institutionally and operationally strengthen the management of water resources in the scope of the states, and improving the coordination between the National Water Resources Management System and State systems, the Program aims to ensure effective governance and thus quantity and quality water supply to the Brazilians in the present and in the future. Knowing the regional differences between the states, the ANA offers a method so that they can join the Pact and fit in a management category according to the complexity of the management process in their domains. Thus, each state can define its own goals in accordance with the current needs in the area of water resources management, associated to a vision of the future. The Program for Development of the Water Sector (INTERÁGUAS) is a Brazilian effort to attempt to pursue a better articulation and coordination of initiatives of the Water Sector. In other words, it creates an environment where the areas involved with the use of water may articulate and plan their actions in a rational and integrated way, in order to contribute to the strengthening of planning and management in the Water Sector, especially in the less developed regions of the country. Learn more on: http://interaguas.ana.gov.br. Created in 2001, the River Basin Clean-up Program (PRODES) aims to reduce the levels of pollution by domestic sewage in Brazilian watersheds, improving the quality of water, in particular those which pose serious problems of water pollution caused by the disposal of sewage without treatment. 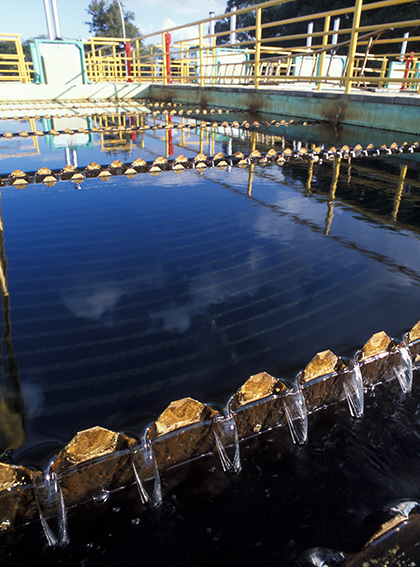 PRODES, known as “Program for Purchase of Treated Sewage”, stimulates public service providers of sanitation to invest in deployment, expansion and operation of sewage treatment plants (ETE), by means of a contract. It does not finance directly works or equipment, nor does it carry out any payment to the service provider prior to the start of operation of ETE. The supplier is only paid after the start of the operation of the enterprises, in reason of the targets for reduction of pollution reached in sewage treatment. The Water Producer Program, designed by ANA in 2001, has as its main objective the environmental regeneration of watersheds with the payment for environmental services for conservation actions concerning water and soil in rural environment, which is reflected in the quantity and the quality of the water that reaches the cities. With different institutional arrangements, the Water Producer already has about 20 projects in progress throughout Brazil. Learn more on: www.ana.gov.br/produagua.